Chemo started later this week. Normally my checkin is scheduled for around 9:00 AM. This week I didn’t need to arrive until 10:30 AM because my oncologist was doing rounds down in the main hospital. However, once we did arrive I checked in like normal and proceeded to have my vitals taken. When the nurse went to put in my IV she searched my hands for a possible vein. In the end she decided to leave my hands alone and actually insert the IV right above my elbow. I found this very surprising considering that I knew the nurses weren’t allowed to insert at the elbow with a chemo as toxic as Vancristine. I guess right above the elbow is okay! I did, however, find having the IV right above my elbow much more uncomfortable. 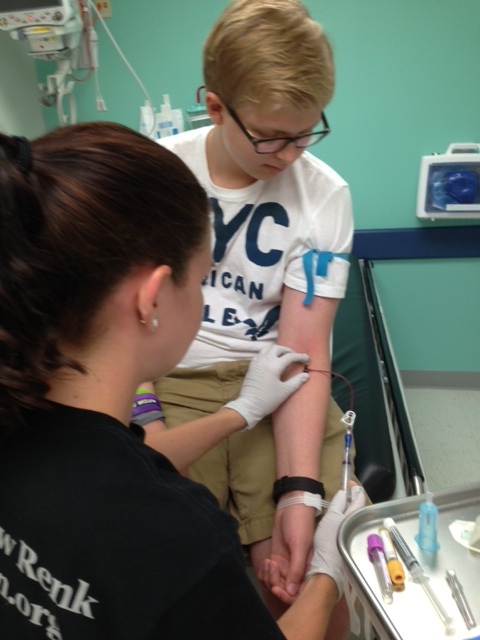 Here you can see the nurse putting the IV in right about my elbow instead of in my hand. As I was leaving the room where the nurse inserted the IV I asked how long it would be before I saw my oncologist. They told me that there was only one person in front of me. However, she wasn’t even back from the main hospital yet. I sat down and the waiting game began. Eventually the nurse practitioner in training came over to let me know that my oncologist was running quite late. However, she said that she’d be able to do my examination if I’d like as to speed up the process. I hopped on this offer knowing she is a very thorough nurse and that I’d be willing to do anything to get things rolling. When we went back to the examination room she asked if I’d be willing to allow her supervisor to sit in on the exam. Still being in training she had to have her supervisor look in on an exam. I was totally fine with this; I knew she’d be great. The exam began like normal and about halfway through my normal oncologist arrived. It was an oncology party! There must have been about five people in the little exam room. One of the things that was different about this week was that some of my counts had dropped more than I’d previously seen from the week beforehand. We talked about them and made sure there wasn’t anything to worry about. The nurse let me know that even know my counts had dropped, they were still extremely high and there was nothing to worry about. That’s when I went back to the day hospital to begin my treatment. This week I was also given an anti-nausea patch along with the Zofran and the Ativan. Another difference in this week’s treatment was that my mom and brother accompanied me during treatment instead of my father. It was really great for them to be there with me and to see what the whole process is like. It became really obvious that I had really mastered the whole process. Being with family members who hadn’t been through the process meant that I really took the lead. I knew this process well! I have it down! The number of people I knew at the hospital also really stuck out. I knew tons of people around the hospital who were greeting me and checking it. At that moment one thing became apparent; I was no longer a beginner to this whole process. I’m a regular now. During the chemo one of the social workers came to talk to my family and I to discuss any possible changes that I’d like to see in the future. They wanted some feed back and I really thought it was awesome that they’re always looking to improve. As always, if you have any questions let me know. Thanks for reading. Josh, Thanks for continuing to share. One of the things I remember about CHOP (Children’s Hospital of Philadelphia) is that whenever my son received chemo or was admitted to the oncology floor, it always felt like a min reunion. If he was well enough, he wanted to know who was there, both patients and nurses. There is a comfort in seeing the same people. I’m guessing at your age, you don’t need to see the Play Therapist, but my son was 6 when he was on chemo, the play therapists were awesome. CHOP does a great job supporting all their patients. It’s great that you got to show your mom and brother that you are a pro. It was a gift you gave them- they can feel a little better knowing you are well cared for at CHOP and specifically, you are handling things so well.